DBZ Guitars NAMM 2010–Another beautiful guitar by Dean B. Zelinsky. DBZ Guitars has unveiled the Bolero Banneret, the first in the new Regalia Series of guitars debuting at the National Association of Music Merchants–NAMM–trade show January 14th – 17th 2010 in Anaheim, California. The new Regalia Series takes guitar building, features and appointments to a new level by incorporating ornate metal embellishments. Utilizing new CNC technology, combined with Old World hand casting, the ornate metal castings are of jeweler quality, detail, and finish. Legendary guitar builder, Dean Zelinsky has always had the reputation of taking the art of guitar building to the next level. With his new company established in 2008, he has created a new platform to push even further and continues to expand on his 30-plus years of innovation. The Regalia Series will broaden the existing models by incorporating a finely crafted, metal, set-in on the bodies of the instruments. The ornate metal casting is designed in high detail and finished in 24k gold and nickel. 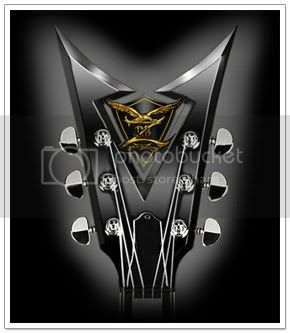 To compliment the body’s metal casting, each guitar will have a matching truss rod cover at the headstock. No doubt this is one hot guitar. How much is it? Visit www.dbzguitars.com for more information.